Winding Constrictor will be a two drop of choice. … line as a “bad” thing. After all, it is pretty easy to not want Winding Constrictor on the battlefield if you imagine yourself playing against Infect. Every usually 1/1 Glistener Elf, Blighted Agent, or Inkmoth Nexus starts hitting with extra force, after all. Mike didn’t think about other counters that “you” get. Sure, it’s bad when you might be acquiring poison counters… But what about energy counters? All of a sudden Winding Constrictor is great again! Winding Constrictor being great at energy, remember. 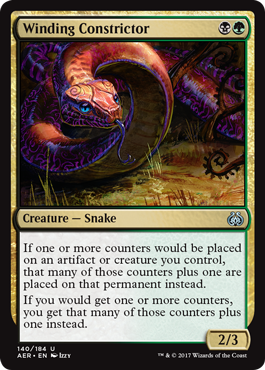 As a 2/3 creature for two mana — abilities aside — this snake can be considered playable on the merits. It might not be Tarmogoyf, but it is unlikely to be completely outclassed on turn two. With a third toughness, the Constrictor can intimidate “industry standard” 2/1 or 2/2 creatures that you might see in the first two turns of the game; and even “bounce off” of a Sylvan Advocate that rumbles in with vigilance. Just think about the first ability in conjunction with Rishkar, Peema Renegade for a moment. If you start with the Constrictor on turn two, then follow up with the Top Level Podcast preview Elf, you will quickly have a dominating board position. Winding Constrictor will go from 2/3 to 4/5 and Rishkar will be 4/4! Imagine something as simple as playing an Aether Hub as your third land. You would start by getting two energy counters (instead of one energy counter) and still go from there. Any cards with a +1/+1 counter theme are game, not just Rishkar. Imagine instead of Rishkar on turn three, you played Evolving Wilds into Greenwheel Liberator. The Greenwheel Liberator would not only trigger its Revolt mechanic, it would get an additional +1/+1 counter, making for a 5/4 creature for just two mana.